Clare C. Burns, 92, a sixty-year resident of West Sayville, LI, died suddenly on April 15, 2019. Mrs. Burns worked for many years as a waitress at Bronco Charlies in Oakdale and later as a monitor in the Sayville Public Schools. She was also a longtime member of the Sayville Seniors. 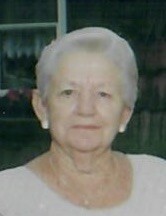 Mrs. Burns is survived by her four daughters, Mary Jane Burns of Sayville, Clare Jenkins of Sayville, Laura Burns of Florida and Ellen Rentz and her husband Walter of Florida, as well as her five grandchildren, Michael, Jennifer, Ryan, Michael and Jack and her seven great-grandchildren, Eric, Sean, Katherine, Jack, Ryan, Aureliajames and Colbie. Friends and relatives will gather 2-4:30 & 7-9:30 p.m. on Wednesday, April 24th at Raynor & D’Andrea Funeral Home in West Sayville. A Funeral Mass will be celebrated at 10 a.m. on Thursday, April 25that St. Lawrence RC Church in Sayville and interment will follow at Calverton National Cemetery. There's still time to send flowers to the Funeral Mass at the St. Lawrence RC Church at 10:00 AM on April 25, 2019.